There is a huge amount of interest in herpetoculture today focused on color and pattern variants of commonly kept reptiles and amphibians. These animals differ, sometimes strikingly, from the wild types in appearance. The differences can be traced to environmental or genetic causes. Genetic mutations can occur spontaneously or are inherited from a parent or parents. Characteristics attributed to environmental influences occur after fertilization. These environmental influences include variables such as incubation temperature and injury. Some traits are decidedly a disadvantage for a free-living wild animal. A strangely colored animal might lack the adaptive benefits of the more cryptic normal coloration. This would make it more likely to become dinner for another animal up the food chain, and less likely to be an effective predator on those animals down the food chain. The color and pattern of an animal-indeed, all physical traits and behavior, as well-have been molded by eons of evolution. The current model of an animal has the attributes that makes it the most fit to survive and reproduce in its environment. Evolution depends on these spontaneous, random mutations. Those with a positive effect increase the survivability of the organism and are passed on to that organism's progeny. Those mutations that have a deleterious effect die with that organism. In a captive situation, a different set of rules applies. As rare, highly prized or expensive animals, color and pattern morphs can command high prices and an important place in collections. It is likely that these animals will receive special care and be more likely to reproduce. Initially, the occurrence of these mutations is very rare and their low survival rate in the wild make it extremely unlikely that they can be obtained and put into a captive-breeding program. The first python differing markedly from the wild type in appearance to become available was the amelanistic form of the Burmese python (Python molurus bivittatus), known in the trade as the albino Burmese. This snake lacks all black pigment, but retains yellows and some pink. I first saw this snake in a March 1981 National Geographic article about the international trade in wild animals. The bright lemon yellow and white snake was owned by a Thai animal dealer. It was imported into the United States and sold by Tom Crutchfield. I obtained that snake in January of 1983, bred it to a normal female and hatched heterozygous (gene-carrying) babies that summer. This trait, as are most of the traits commercially available in reptiles, is recessive. When an animal showing the trait is bred to a normal animal, the offspring are normal in appearance. For the offspring to exhibit the trait, both parents must show or carry the trait. In contrast, a dominant trait requires that only one parent have the trait, and all individuals that carry the trait exhibit the characteristics of the trait. just a hobby that consumed dollars. It was a little disturbing to me at the time that no one seemed to be keeping these snakes for the enjoyment of it. Looking back, I think, in most cases, the profit motive was a justification that helped rationalize the purchase of an attractive, desirable, but expensive animal. I credit the albino Burmese python for allowing me to establish my own business breeding reptiles full time, generating the income necessary to allow it and increasing the market to make it all possible. In 1987, the second python mutation was produced in captivity. Tom Weidner of Des Moines, Iowa, purchased an olive green, patternless Burmese python from Western Zoological Supply in West Covina, California, in 1974. The $650 selling price was, at the time, high. The snake-a male-was not a motivated breeder. It bred only once, producing offspring in 1984, and died shortly thereafter. These heterozygous snakes produced their first offspring in 1987. A percentage of these snakes exhibited the new trait. The snake has been named "green" or "patternless" after the original adult, and these names are accurately descriptive of the adult animals. The babies, however, are neither green nor patternless. Hatchlings of this type are khaki-colored, fading to silver on the sides, with a broken line of chocolate brown spots down the center of the back and sometimes scattered randomly along the sides. With age and size, the snakes darken to an olive green, and the spots fade and become less and less apparent. The green Burmese and the albino were bred together, and because both mutations are recessive, the babies looked like the normal, wild-type snake. When these snakes produced offspring, by appearance, four types hatched. The largest percentage of the babies looked normal, there were equal percentages of green and albino snakes, and a very few snakes were albino with the green pattern. The laws of probability dictate that only one in 16 hatchlings will show both traits. My first breeding of the double recessive snakes produced no "green" albinos from 29 eggs (it's the same problem that plagues the local weatherman). Later that year, Mark Bell, now of Naples, Florida, hatched the first of these new snakes. The snake was light orange fading to almost white on the sides, with darker orange spots centered on the dorsal midline. The snake becomes yellow and the pattern fades as it grows. In October of 1988, German reptile dealer Peter Hoch told me about two strangely patterned Burmese pythons that he had imported from Thailand a few years earlier, and had since sold. I expressed an interest in these snakes, and he agreed to try to locate them. He was successful, and a few months later, I received the snakes in Oklahoma. Fortunately, the two snakes were a sexual pair, and although they were just 7 feet long, they produced a small fertile clutch of eggs in early 1989. The hatchlings from this clutch were identical to their parents, with an intricate gold pattern on a black background. The phase was named "labyrinth" after its chaotic mazelike pattern. Two additional wild-collected animals were added to the breeding group from the late Dave Lester of the Serpentarium in Walsall, England. Another labyrinth Burmese python of wild origin was obtained by Mark Bell from a private collector in the United States. Mark produced the first albino labyrinth in 1993 by breeding the offspring of an albino x labyrinth cross. This is a striking form, where the black areas are replaced by bright white. These areas in the normal type of albinos are orange. The result is a high contrast gold and white snake. During the writing of this article, I acquired a new Burmese python mutation said to have originated in Thailand. The new morph has very small, angular, golden brown spots on a yellowish background. The spots and ground color cover roughly equal amounts of surface area. Each scale of the light areas has a dark center. The ventral surface is unmarked. The spear-shaped marking of the head is greatly reduced and irregularly shaped. The remaining area of the head's dorsal surface is light pinkish tan. Several of these snakes hatched from the same clutch of eggs. The grandfather of the snakes is said to have been identical to the babies in color and pattern. Indeed, I have a picture of that snake, skinned and tanned, and it is identical to the young snakes. The mother is said to have been normal in appearance. If both normal-looking parents of the babies were offspring of the original, now skinned adult, we could explain the occurrence of the trait as the operation of a simple recessive gene. I have named this form the "granite" Burmese python for the fractured, broken aspect of the small spots on the snake's dorsal surface. The albino, green, labyrinth and granite forms are the only known genetic mutations of the Burmese python. The albino "green" and albino labyrinth have been produced. At the time of this writing, the green labyrinth combination and none of the combinations including the new trait have been bred. All three of these traits are mutations of pattern, and it is unknown how the combinations will be expressed. The amelanistic forms of these combinations also have yet to be seen. The granite trait gives nine new possibilities when combined with existing traits and trait combinations. 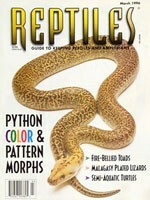 In 1989, I became aware of the possibility of the existence of an amelanistic ball python (Python regius). My friend Olaf Pronk, then of The Hague, Netherlands, had received word via Telex, that the snake had been captured in Ghana. I had heard this type of rumor before, and in every case the snake apparently did not exist. We obtained a picture of this animal and started negotiations to acquire it. In May of that year, I received the snake, a young male about 26 inches long. It was bright lemon yellow and clean white. The snake's high contrast, bright color and small adult size created much interest and anticipation among the snake-buying public. The young albino was imported as a nonfeeding, wild-caught individual with all the associated problems and worry that go with such an animal-especially a ball python. The snake fed voluntarily in due time, and while it was thought to be too small to breed, it did so that fall. The heterozygous generation hatched in the spring of 1990. These snakes grew quickly, bred and laid eggs that hatched when they themselves were only 2 years old. I remember clearly the morning during May of 1992. I checked the maternally incubated clutch to find the female coiled loosely around the eggs, exposing one egg with a pink and yellow head protruding. Two years of anticipation had ended! I was fortunate to avoid any jubilation-related injury to myself in the short private celebration that followed-it was a very good day. Expensive and desirable, these snakes have held their price at $7,500. On the night of August 18, 1994, my breeding facility was burglarized, and the majority of my colony of these animals was stolen. The thieves took the founding male albino and a group of heterozygous females each incubating eggs. Some of the eggs were due to hatch in a matter of days. In spite of the loss, I still maintain a small viable breeding group of albino ball pythons. The future holds promise for several new types of ball pythons. A piebald morph with broad areas of bright white and varying amounts of normal pigmentation has been bred, and if the trait is genetic, offspring with the trait can be expected within the next two or three years. Several axanthic individuals exist and have been bred. These snakes lack yellow pigment and appear as black, gray and white snakes. If this trait can be reproduced and combined with the albino form that lacks black pigment, the resulting snake should be totally without pigment. The corn snake (Elaphe guttata guttata) has a comparable morph. The two pigments responsible for most of the color in this snake are red and black. When the two traits are expressed in the same snake, the resulting snake has been named the "snow corn." The pigmentless ball python could have the very appealing name of "snow ball." Other breeders are working with ball pythons that are very dark or very light in color, have high contrast or unusual amounts of yellow or orange. Various striped forms and unusual patterns exist, but as yet only the amelanistic condition has been shown to be genetic. Karl Hermann of St. Paul, Minnesota, purchased a strange-looking reticulated python (Python reticulatus) during the fall of 1991 from a private collector in this country. The snake, a wild caught male of unknown origin, has a pattern that appears to be duplicated laterally along the dorsal midline. The dark median line through the top of the head is absent from the eyes forward, and the white areas on the sides are enlarged and lengthened. This snake bred and produced babies in the summer of 1993, and roughly half the babies had the pattern of the father. Karl has named this form the "tiger" retic. It was not apparent at first what had happened. No one had expected to see the trait appear in the first generation. If the trait was genetic and recessive, as are all other known mutations in snakes, the first generation offspring should be heterozygous and look normal. The trait should appear in the next generation when these animals are bred. If it never appears, it could be determined that the condition has another cause. In this case, the mutation was determined to be dominant. With a dominant trait, the condition is expressed in the heterozygous animals. Because the father was himself heterozygous, he could pass the trait on to only half of his offspring. The normal looking siblings were, in fact, normal (not gene carriers). If they had carried the gene, they would have shown the trait. As more of these snakes have been bred, the trait has proven to be fairly variable. In some cases, the pattern is reduced, sometimes to the extent of having no pattern along the dorsal midline, or sometimes just a narrow black stripe. In other cases, the snakes have a series of small paired blotches along a medial stripe. All snakes lack the head stripe, and all seem to have docile temperaments, in contrast to many reticulated pythons. During April of 1993, 1 imported a male amelanistic reticulated python from Malaysia. In this snake, the gold pattern is replaced with bright lemon yellow, the gray areas with white, sometimes with a yellow wash, and the black areas with an almost translucent lavender color. The snake was wild caught when it was about 9 feet long, and it remains so two years later, due largely to the fact that it refused to feed voluntarily for almost exactly two years. In late April of 1995, the snake started feeding voraciously and now rarely refuses a meal. In spite of the snake's difficult acclimation and its small size, it was observed breeding last spring, even though at that time it had still refused to feed. Heterozygous offspring were produced this year. I hope this morph will be available in the near future. There is an incredible diversity of colors and patterns in normal wild type pythons. Some purists may frown on the popularity of the captive-propagated variants, believing that these animals are unnatural and somehow less worthy of their attention. If we consider the rest of the animals we keep as pets, indeed all of the organisms that have been associated with humans through history, the production of python color and pattern morphs is typical. There has always been the selection of desirable traits. Consider tropical fish, cage birds, orchids and agriculturally important plants and animals. Few would agree that a chicken with less meat and laying ability is more desirable because it more closely resembles its wild ancestor. The differences in goldfish and carp, and my dog and a wolf are both generally appreciated by the pet-keeping public and people in general. The future almost certainly will give us new python morphs and increased availability of existing ones. I, for one, am excited about the possibilities. Bob Clark has been breeding pythons for more than 20 years. He has operated on a commercial level since 1988, producing pythons for collectors and breeders both in the United States and abroad.